When Calls the Heart is one of a few television serious that I can safely say to everybody that it is family-friendly. You don’t have to worry about weird things happening and you can watch it with your whole family. I love that this is a goal for the Hallmark Channel where this show airs, to provide content that can be viewed by all audiences. This particular series is inspired by the books written by Janette Oke and it follows main character Elizabeth Thatcher as she arrives at the town of Coal Valley. The Christian DVD When Calls the Heart: Forever in my Heart tackles different stories like for example, Abigail opens her house to Becky once again before making a decision that can change their lives as a family, on the other hand, Jack is preparing towards taking a big step for him and Elizabeth’s future. At the beginning of this Christian movie, we see that Jack and Bill are over at Lee’s sawmill wondering the reason why so many men have been injured and how Lee is having a hard time keeping up with everything. Because so many accidents happening, jobs are decreasing, therefore, Lee has to cut back on the current workers. The results of this is that production takes more time and the costs go through the roof. Something has to happen because if not the town we’ll be in jeopardy and this town fully depends on the sawmill. Jack and Bill both think that it has been sabotaged but they don’t have any leads on a suspect. Lee hands them a list of the names of all employees and all that is left to do is to sit down with every one of them and interview them to see if they have information or clues that’ll lead them to the suspect so the investigation can go on. Also during this time, we see that Cody receives a letter that tells him that Becky has recovered and she has planned to return to Hope Valley. Since she had stayed such a long time at the hospital, Cody is really excited to have her sister back in town. Soon Becky arrives in town but she is actually in a wheelchair which comes as a shock to Cody who is used to seeing his sister up and about and healthy. Seeing her this way kind of upsets him as he doesn’t understand the reason but he gets adapted to it and he’s just happy to have his sister back with him and Abigail. Now regarding Rosemary, she has been struggling a bit because she misses the stage and being in the spotlight. She hasn’t had the opportunity to display her acting skills, sing or to truly show what she can do since she moved to town. But later on this Christian movie, Rosemary hears that I director A film director is coming to town to shoot a feature film. In this moment she feels that everything is going to change for her and that this is her chance to go back to acting as the lead in a feature film. This is the opportunity that she has been hoping to find for such a long time. 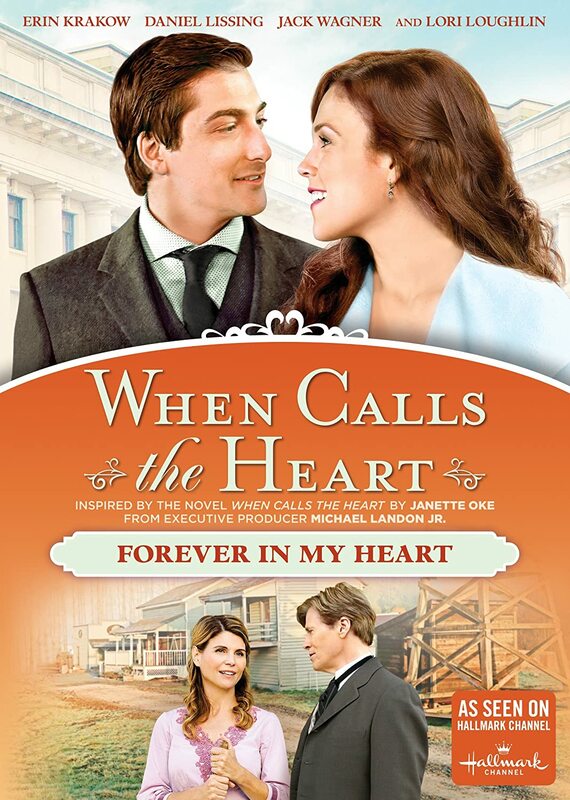 Now in When Calls the Heart: Forever in my Heart, Jack and Bill can’t seem to find any leads towards who sabotaged the mill as they’ve interviewed pretty much everybody can’t think of anyone who has problems with Lee. So they come to the conclusion that maybe the thing that is motivating to sabotage is the money factor. And they also come to the conclusion that maybe there’s one person who can actually benefit from all this and that is the town’s mayor, Henry Gowen. Elizabeth from When Calls the Heart: Forever in my Heart, serves as a motivator to Becky in this Christian DVD. Elizabeth notices how good Becky draws and encourages her to enter a Science fair because with her talent she can actually win. Also, Elizabeth encourages Becky to practice walking again because she notices that maybe Becky is kind of scared to do so. Also in this Christian movie, Jack takes it upon himself to help a couple from the settlement and restore their relationship as a family. I completely recommend the Christian DVD When Calls the Heart: Forever in my Heart!